Home › Events › Double Points and Panther Creek Chili COOK OFF! Double Points and Panther Creek Chili COOK OFF! Dallas New Year's H.O.G.® Event! Panther Creek HOG Chili Cook off in Allen Texas near Dallas! 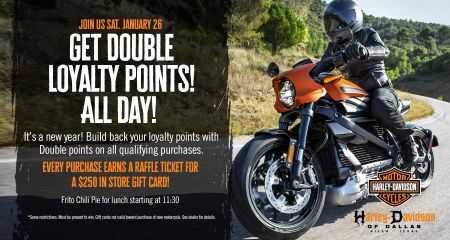 It's a new year, start building back your loyalty points with double points on all qualifying purchases. EVERY PURCHASE EARNS A RAFFLE TICKET FOR A $250 IN-STORE GIFT CARD! Join us January 26, with free chili pie starting at 11:30.